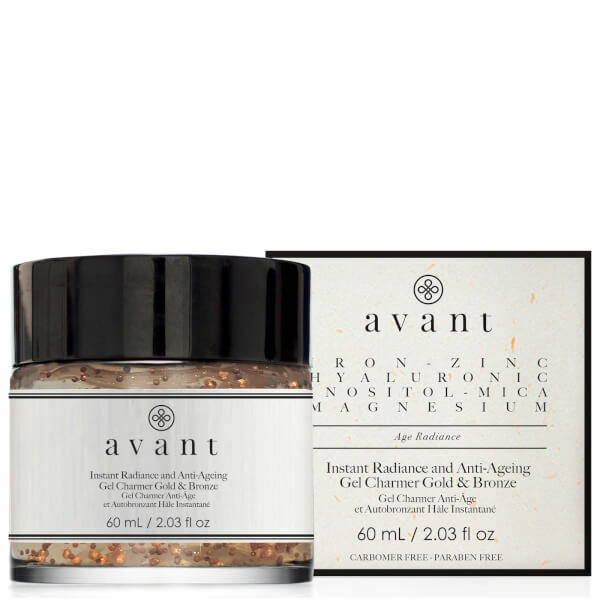 Reignite skin’s natural glow with Avant Skincare’s Instant Radiance and Anti-Ageing Gel Charmer Gold & Bronze; a radiance-enhancing moisturiser with powerful anti-ageing and hydrating powers. With micro gold and bronze pearl particles suspended in an innovative, transparent gel base, the non-greasy and non-staining formula rapidly absorbs into skin, dispersing a natural-looking sun-kissed glow that highlights and enhances skin with a golden warmth. Skin-replenishing Inositol active helps to stimulate melanin synthesis, whilst Mica delivers light-reflecting properties to illuminate the complexion. Energising skin with a mineral cocktail of Magnesium, Iron and Zinc, the Hyaluronic Acid-powered moisturiser leaves skin recharged and nourished. Apply to cleansed skin after toners and serums. Acrylates/C10-30 Alkyl Acrylate Crosspolymer, Aqua (Water), Butylene Glycol, Calcium Sodium Borosilicate, Caprylic/Capric Triglyceride, Cellulose, CI 77491, CI 77492, CI 77499, CI 77891, Disodium Edta, Ethylhexylglycerin, Glycerin, Gold, Hydroxypropyl Methylcellulose, Mica – CI77019, Parfum (Fragrance), Peg-40 Hydrogenated Castor Oil, Phenoxyethanol Potassium Sorbate, Ppg-26-Buteth-26, Saccharomyces/Copper Ferment, Saccharomyces/Iron Ferment, Saccharomyces/Magnesium Ferment Saccharomyces/Silicon Fermentsaccharomyces/Zinc Ferment Silica, Sodium Hyaluronate, Sodium Hydroxide, Tin Oxide.